Money Tree Math Game | Learn to Count Coins the Fun Way! Counting coins is an important math and life skill made fun by playing our Money Tree Math Game. Learn that five pennies is equal to a nickel and so on with this hands-on money game! After reviewing coin names and their value during President's Day, I was inspired to make my own money game to help Big Brother learn that 5 pennies = 1 nickel, 2 nickels = 1 dime, etc. I made a Money Tree Coin Value Game and found that although he knows the value of each coin, he would still insist that 6 cents (1 nickel and 1 penny) was actually 2 cents, which is a pretty common mistake for children learning how to count money. Big Brother received a Melissa and Doug Money Set a couple years ago, and it has finally come in handy! 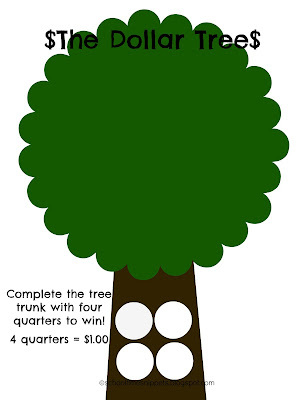 I made a printable of a tree with the tree trunk having four spaces for four quarters. When you collected 4 quarters to make a dollar, you win! Hence, you completed the dollar tree! We played this together and it took 20 minutes to 1/2 hr. to play... But I can say, that we've played two times since and he now knows that when he has 5 pennies, he can trade them in for a nickel! And when he has two nickels, he can trade them in for a dime. Yay! He's learning and having fun at the same time! Just what I wanted when I came up with this game! Eventually, I can show him that 10 pennies is 1 dime, etc. But for now we are working on making nickels from pennies, dimes from nickels, etc. However, feel free to switch it up to meet the ability of your child. Spin the spinner and collect that amount of pennies (1, 2, 3, or 4). If you land on "Trade Up!" and you cannot exchange your coins, either you lose your turn or spin again. You can decide how to play. We chose to spin again to make the game go a bit faster! Continue to spin and collecting pennies onto your tree. When you land on "Trade Up!" begin with trading pennies for nickels first, then move onto nickels for dimes....etc. When you are able to make a quarter, place the quarter on the tree trunk. The first one to complete their Dollar Tree, wins! I've since had to update our gameboard because of a computer crash. Sigh! But here is another game board for you to use. You will need to make your own spinner or dice though! Enjoy!